The “Intercity Through Train” service links Hong Kong to mainland China, running express across the border from Hung Hom station. Jointly operated by the MTR Corporation of Hong Kong and the Chinese Ministry of Railways, these trains are normally hauled by electric locomotives. However the MTR fleet of diesel locomotives is occasionally found up front of these trains, on empty car moves to/from the railway workshops. Here we see Siemens Eurorunner ER20 locomotive #8004 hauling a set of empty 25T coaches through Tai Wai station, bound for Hung Hom. The diesel engine later returned to the East Rail Line depot, running light engine. Classmate #8003 arriving at Hung Hom with another set of 25T coaches, with another empty car movement. The double deck KTT train set is usually hauled by a pair of electric locomotives in push-pull formation, but can be hauled by a single unit when maintenance is required. Here we see EMD G26CU diesel locomotive #61 dragging the empty KTT set out of the East Rail Depot at Tai Wai, bound for Hung Hom. Here the train entered service, headed northbound with a single electric locomotive in the lead, and the diesel left behind in Hong Kong. ER20 diesel locomotive #8001 has also been used on a similar KTT set movement, seen at Mong Kok East station. As has locomotive #8005, seen at Kowloon Tong. 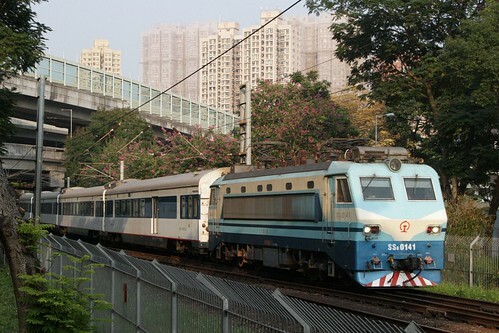 China Railways trains into Hong Kong are usually hauled by a single locomotive. 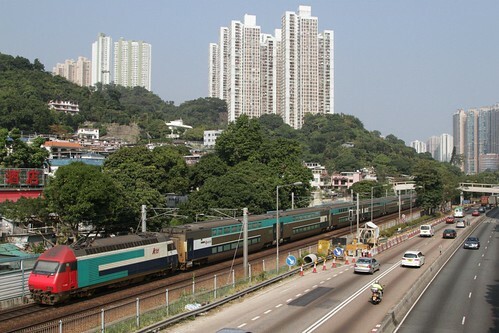 But double headed trains occasionally cross the border into Hong Kong, such as this pair of SS8 electric locomotives in 2015. This double headed SS8 locomotive train in 2013. A SS8 electric paired with a DF11 diesel in 2011. And another SS8 electric with DF11 diesel double header in 2012. This entry was posted in Transport and tagged China Railways, double headed, East Rail, Hong Kong, KCR, Kowloon, Mass Transit Railway, MTR, MTR Intercity Through Train, rail operations, railway, trains. Bookmark the permalink.